Many people decide to become teachers for idealistic reasons. They want the opportunity to teach and mold tomorrow’s generation. However that doesn’t mean teachers cannot make strategic decisions about where to become teachers. Certain places in the country offer teachers higher pay, more affordable housing and greater job security. 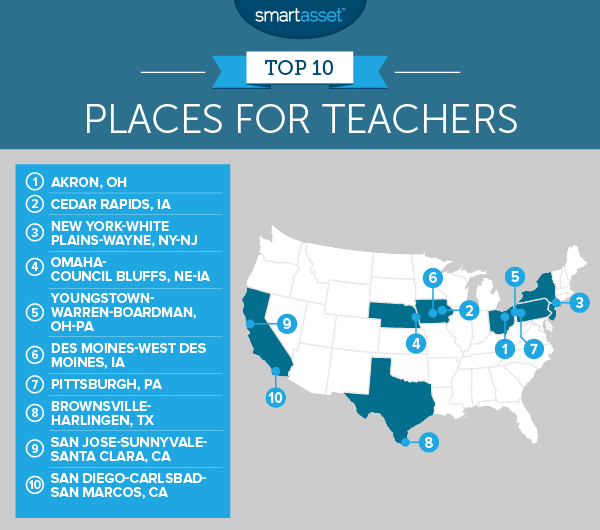 Below SmartAsset looks at these and other factors to find the best places to be a teacher. Looking for a new home? Check out the latest mortgage rates. In order to find the best places to be a teacher, SmartAsset analyzed data for nine metrics. We looked at data on average incomes, income growth, employment growth, spending per student, union strength, housing costs, high school graduation rate, proficiency rates in math and English and violent crime rates. Check out our data and methodology section below to see where we got our data and how we put it together. This is SmartAsset’s third annual study of the best places to be a teacher. Check out the 2016 version here. Iowa, land of the learned – Iowa has four different metro areas crack our top 15. These metro areas score strongly in our education metrics like graduation rate and student proficiency rate. Plus, these metros tend to be relatively affordable for teachers. Florida flops – Florida has five different metros in our bottom 15 places that ranked the lowest. In general teachers in Florida are not well paid and lack support in the form of funding. According to our data, the bottom five ranking Florida metros spend an average of just under $9,000 per student. Akron rose one spot from last year to claim the title of the best place to be a teacher. It offers teachers the chance to work with other high-performing educators and students. On average, 78% of students tested as proficient in math and reading, combined. That’s the fifth-highest score in our study. Jobs in teaching are also springing up all over Akron. According to our data, there’s been an 18% growth in teaching jobs from 2014 to 2016. Previously we found that Cedar Rapids is a great place for children. One reason it’s so good for children is because of the local education system. So it makes sense that Cedar Rapids does well in this study, too. Our data shows Cedar Rapids has the third-highest proficiency score in reading and math, for example. Cedar Rapids is also a very livable place for teachers. It has a top 20 score for lowest violent crime rate and housing costs are only $869 per month. The New York area is a great place to work as a teacher. According to our data, this metro spends the most on a per student basis, meaning teachers should be well supplied with textbooks and other necessities. Teachers here also make the second-highest salary in our study. According to our data, teachers around New York make just under $80,000 on average. Of course, living in and around New York means having to contend with the high costs of living. Our data shows that housing costs here are over $1,550 per month. For teachers who are looking for a place where their talents are well respected, Omaha-Council Bluffs should be intriguing. According to our data, teachers’ incomes here rose 16% from 2014 to 2016. The number of teaching jobs around this metro area also grew around 5%, a good sign for future job prospects. Another positive is the fact that Omaha-Council Bluffs have a student proficiency rate of 75% (in combined average math and English language arts scores). This metro area has one of the highest graduation rates in our study (90%), a sign that teachers are doing good work. Another great reason to be a teacher here is the cost of living. According to our data housing costs here are only about $650 per month. That means teachers can start saving for retirement earlier. Like Cedar Rapids, Des Moines-West Des Moines has a strong education system. Just under 90% of students graduate high school and the area’s proficiency score is 78%. For both of those metrics, Des Moines-West Des Moines ranks in the top 25. Another plus to teaching here is employment growth for teaching jobs. From 2014-2016, the number of teaching jobs grew over 13%. Pittsburgh spends a decent amount of money per student, a good metric for teachers to be aware of. According to our data, the metro area spends about $14,800 per year on students, the 16th-most in our study. Teachers in this metro should also have stable careers. We found Pennsylvania has the fourth-strongest teacher union, giving teachers in the state a strong support system as well as a sense of community. When you initially look at this metro area in the Lone Star State, you may wonder how it managed to break into the top 10. Teachers here have the lowest average income in our top 10 ($51,871) and the metro only spends about $9,500 per year on students. But those numbers are a bit deceiving. Thanks to low costs of living both of those numbers go further than one might think. According to our data, average housing costs in Brownsville-Harlingen are only $615 per month, almost four times less than San Jose ranked below. Plus, teachers here do a great job educating their students. Around 90% of students graduate and the area’s proficiency rate is 71%. San Jose teachers get paid a lot. According to our data, the average teacher earns over $75,600 per year. That number will probably continue to climb as from 2014 to 2016, teachers here saw incomes grow 5%. There also seems to be plenty of teaching jobs in this metro area. The number of teaching jobs grew 6.6% from 2014 to 2016. Furthermore, California has the sixth-strongest teacher’s union. Of course, you should be aware that housing costs in this part of the country are astronomical. Our data shows the median house costs over $2,200 per month. Our list ends in another California metro. San Diego-Carlsbad-San Marcos pays its teachers a high salary on average. 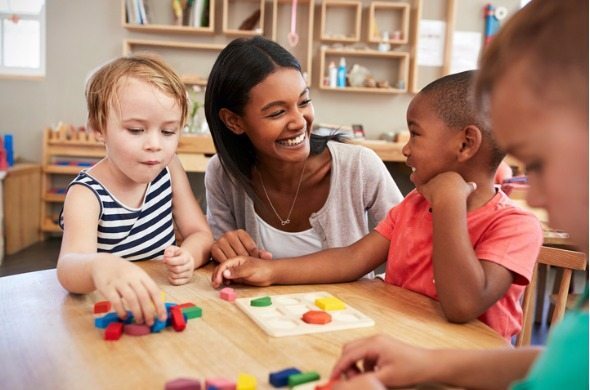 According to data from the Bureau of Labor Statistics, the average teacher here makes just under $72,000 per year. San Diego is also a more affordable option for teachers than some other parts of California. The median house costs around $1,600 per month. Other quality of life metrics should also make San Diego a good place to live for teachers. This metro has the 25th-lowest violent crime and a graduation rate of 88%. Average income. This is the average income for teachers. Data comes from the Bureau of Labor Statistics and is for 2016. Income growth. This is the percent change in average incomes for teachers from 2014 to 2016. Data comes from the Bureau of Labor Statistics. Employment growth. This is the percent change in the number of people employed as teachers from 2014 to 2016. Data comes from the Bureau of Labor Statistics. Spending per student. Data comes from the Census Bureau’s 2015 primary-secondary public education finance report. State teachers’ union strength. Data comes from the Thomas B. Fordham Institute. Housing costs. Data comes from the Census Bureau’s 2016 1-year American Community Survey. High school graduation rate. Data comes from the U.S. Department of Education and is for the 2014-2015 school year. Percent proficient in math and reading. Data comes from the U.S. Department of Education and is for the 2014-2015 school year. Violent crime rate. This is the number of violent crimes per 100,000 residents. Data comes from the FBI Universal Crime Reporting database and is from 2016. We then ranked each metro in each metric. Then we found each city’s average ranking giving equal weighting to all metrics. We used this average ranking to create our final score. The city with the best average ranking received a 100. The city with the worst average ranking received a 0. Make sure you do a lot of research ahead of time. If you are making the move for professional reasons, like taking a higher paying job, make sure you aren’t taking a loss once you factor in costs of living. Housing costs and taxes vary by location and you may end up spending your whole raise just on housing. Check out our cost of living calculator to help see the difference between where you are and where you might be going. And a paycheck calculator can help you estimate what your take-home pay will be. Consider putting your moving expenses on a rewards credit card so you can earn valuable points for money you’d already be spending. Just make sure you pay the bill in full and on time. After all credit card interest payments can get expensive.